Zamir, a bioengineer at Georgia Tech, set out to remedy this using the eggs of Japanese quail5. Along with grad student Matthew Futterman and fellow engineer Andrés García, Zamir used domestic quail to generate a number of developing embryos in-vitro. By stopping these embryos at specific stages in development and treating them with fluorescent antibodies to mark certain proteins, the researchers could track how the proteins are expressed as the cells make their way around the egg yolk. They found that two different connective filament proteins, vimentin and cytokeratin, form a dense network at the leading edge of the migrating cells. They also observed tight filament bundles, a structure that probably bears the mechanical load of the migration. This was somewhat of a surprise. Typically, vimentin and cytokeratin are expressed in entirely different types of cells: connective versus epithelial tissues. Co-expression of these two proteins has never been seen in the model organisms used to study development in the lab, the African clawed frog and zebrafish. Yet there are important cases where this combination, known as the “epithelial-to-mesenchymal transition“, occurs: wound healing and cancer metastasis in humans. As with the avian egg, both involve sheets of cells undergoing a great migration. 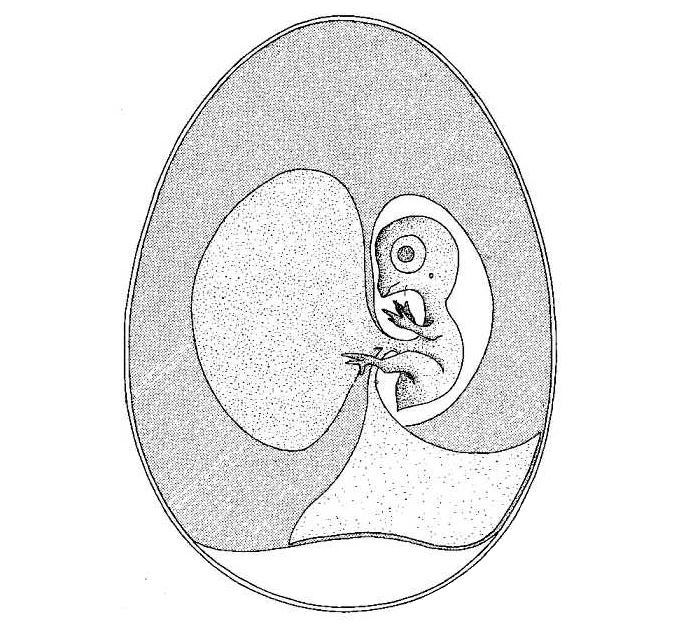 In their paper, Futterman, Zamir and García suggest that this transitional phenotype could be unique to avian embryo development, at least compared to the other model systems. If so, bird eggs might be a valuable tool for addressing the role of collective cell migration in cancer treatment and surgical medicine. There may be other opportunities to improve our understanding of cancer by expanding the kinds of organisms we study. One has to do with Peto’s paradox. If cancer is caused by the accumulation of mutations in cells of the body with time, giant animals like blue whales with many more cells than us should be dying of cancer at a relatively young age – not living past 100 as whales often do. Contrary to expectation, there is absolutely no correlation between body size or life span and the prevalence of cancer across animal species6. Why don’t large-bodied, long-lived organisms get cancer as often as we do? Sometimes, the very things that make model organisms so amenable to lab life can limit what we get out of them. For further reading on Peto’s paradox, “The Mere Existence of Whales” by Carl Zimmer is well worth it. Innes, J. 2002. The Scotsman. 26 August 2002. McKinley, J. C. 2005. The New York Times. 25 August 2005. Lilico, S. C. et al. 2007. PNAS 104: 1771-1776. Robinson, A. 2011. Georgia Tech Research News. 23 March 2011. Futterman, M. A. et al. 2011. Developmental Dynamics. Caulin, A. F. and Maley, C. C. 2011. TREE 26: 175-182.